The Affenpinscher originated in Germany, with examples of the breed dating back to the seventeenth century. The name Affenpinscher is derived from the German word for monkeyAffe. Affenpinschers were established to hunt and eliminate rodents, leading to their high activity level and energetic demeanor. 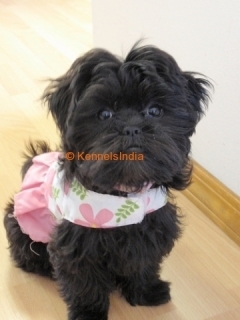 The Affenpinscher has a shoulder height of 25-30 cm9.75-11.75 in and 3.1-3.6 kg7-8 lbs. It is a small dog with a square body and large chest. The Affenpinscher has a short nose and undershot jaw with black eyes and a short, arched neck. The ears and tail are often docked. 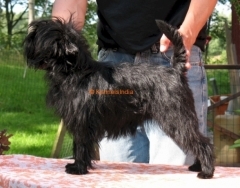 The Affenpinscher has a coarse, swirled coat--generally solid black coat, but sometimes brown or gray. Tan or red markings may be present. The Affenpinscher coat is shaggy, at approximately an inch in length, and the hair is longer but less thick on the face and legs. The Affenpinscher has a low level of shedding. Affenpinschers are intelligent, friendly, loyal, alert, spunky and lively. They are highly defensive of their food, toys, and territory. The Affenpinscher will take the reins to defend its loved ones when necessary, though due to its small size it is not recommended as a guard or watch dog. The spunky, fearless Affenpinscher makes a great companion. The Affenpinscher has a personality similar to most terriersthough it is categorized under the pinscher-schnauzer subgroup. The Affenpinscher gets along fine with children, other Affenpinschers, and other dogs or household pets, especially those they have been raised alongside. Affenpinschers may be alarmed by unknown visitors. The Affenpinscher enjoys playing and occasionally getting into trouble, like the monkey after which it is named! While generally quiet, the Affenpinscher can become aggressive when agitated and may occasionally pick battles with larger dogs. The hair on the Affenpinscher should never be clipped, as it ruins the coat. The coat may need to be plucked periodically by a professional dog trimmer. Frequent grooming--two to three times a week�is recommended due to the long coat. 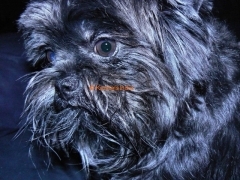 Like other short nosed breeds, the Affenpinscher may face respiratory issues in very hot weather. 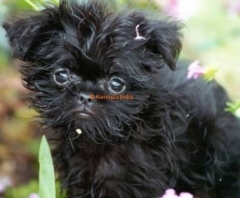 The Affenpinscher can live ten to twelve years and has an average litter size of two. Stray hairs around the eyes should be removed immediately. Training for the Affenpinscher must be consistent and firm. It learns most commands fairly quickly, but may take some time to housebreak. Some variety in training is recommended to keep the Affenpinscher interested. Affenpinschers enjoy quick, short walks several times a day. Regular playtime keeps Affenpinschers happy. The Affenpinscher appreciates indoor playtime, but an outdoor play area is ideal. The Affenpinscher also enjoys hikes, though it should be watched carefully due to its daring nature.